Enjoy a neater, more spa-like shower! 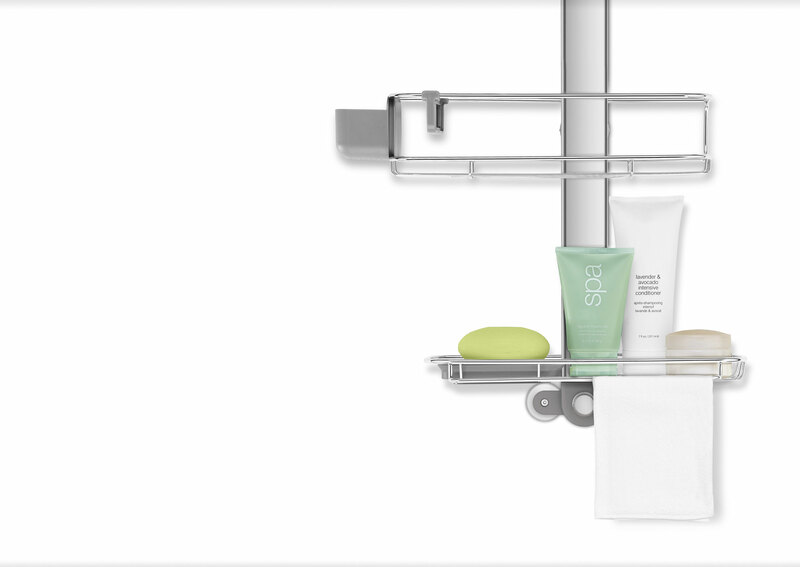 Our new adjustable shower caddy plus offers more shelf space and even greater adjustability. In addition to movable shelves, the neck can extend up to 30cm to make room for those really tall bottles. It also lets you position the caddy lower for easy access — very child-friendly. Innovative dividers and compartments are designed to hold bulky modern tools like facial cleansing brushes and oversized razors. Constructed from stainless steel and anodised aluminium so it is rustproof and easy to clean. Slide up, down and sideways to make room for taller bottles. Large, modern shower accessories are hard to fit. Our innovative storage options are designed specifically with those tools in mind. Solid materials and secure installation give our caddies the feel of built-in fixtures. 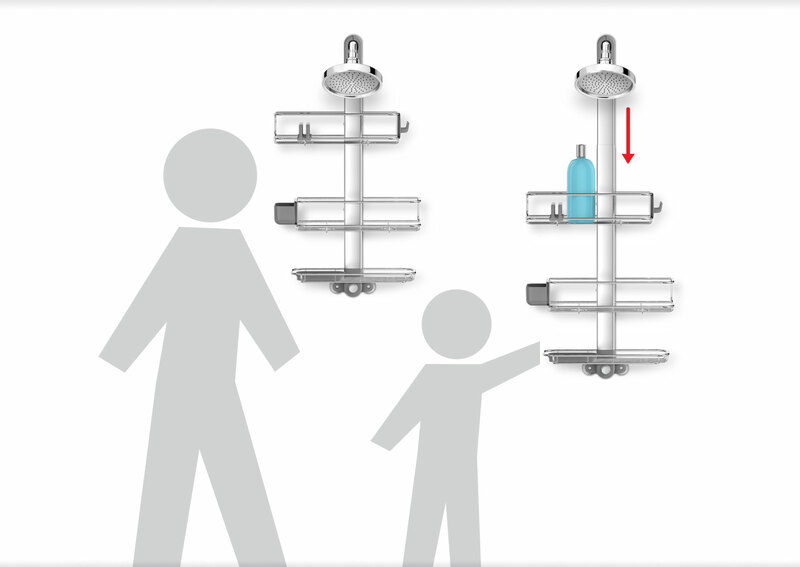 Our new plus model has extra capacity and an extendable neck — a great family organiser! We added a full bottom shelf, washcloth hanger, small item holder and an additional divider. It also lowers the caddy for easy reach — very kid-friendly. The neck is extendable to make room for taller bottles on the top shelf. Easily reposition shelves with a quick turn of the dial. Drains water completely so soap stays dry and lasts longer. 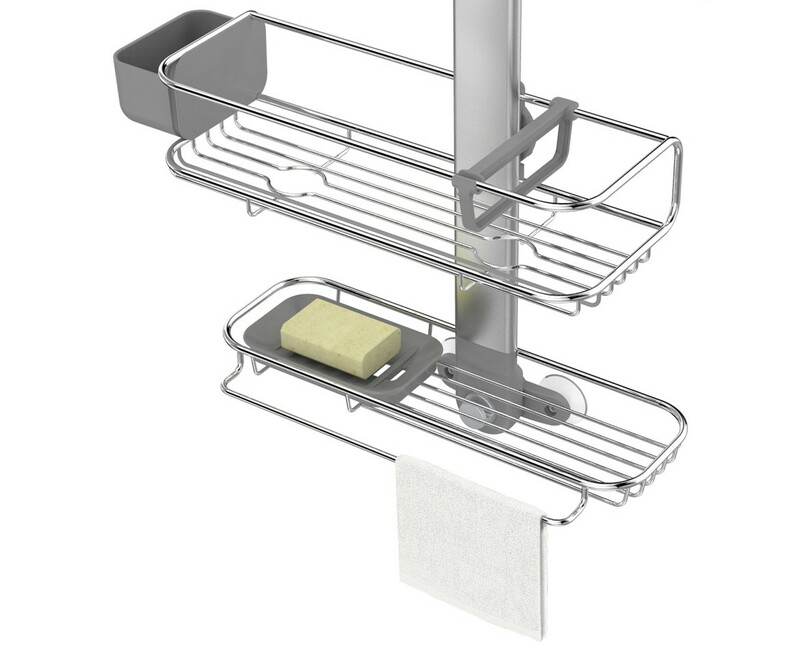 Helps keep small items from falling over (2 dividers on shower caddy plus only). Store bottles upside-down for effortless dispensing. Hold a razor, loofah or other accessories. Wire lip on bottom shelf is perfect for holding washcloths. Securely stores small items like rings or hair ties. I bought two Simple Human shower caddies, neither fit anywhere in my house!! SO i've asked to relocate, cannot live without my Simple Human Products, at all. Easy to use, so well thought out. A DREAM. The sheer quality of these products, make me search for my next SH purchase. Lovely to operate, simple, sumptuous, pleasant to clean, staff are friendly, helpful, I adore this company. I have not met anyone who doesn't love the SH products, that i've bought, very impressive! Thrilled with my purchase. Love the storage space. Great quality and capabilities for adjustments. Love how there are two razor storage hooks. Three teenage kids share this and there is still room to spare. Would highly recommend! Exactly what I was looking for, the best shower caddy I've ever used! Expensive but worth it. Sturdy, stable and fits everything . Fully adjustable. Love it - wouldn't buy anything else. We have no shelving as most don't in standard baths with shower. This is THE solution for everything we need in our shower. I utilize the racks often for washcloths and none of the metal is having any trouble keeping rust and soap buildup away. I haven't had any of the suction cups loosen since installation. I appreciate the versatility and shelving options. I have made use of 95% of the features in the caddy personally and I feel it is just right for my needs. Very good product. Sturdy, efficient, flexible, durable attractive. Sliding shelves and mount are great. Two features that could be improved: make the plastic hooks relocatable, improve the separate suction cup hooks. They often drop off the wall even when it's a smooth surface. I'd buy it again. Our adjustable shower caddy plus comes with suction cup stickers that help in adhering to the wall. 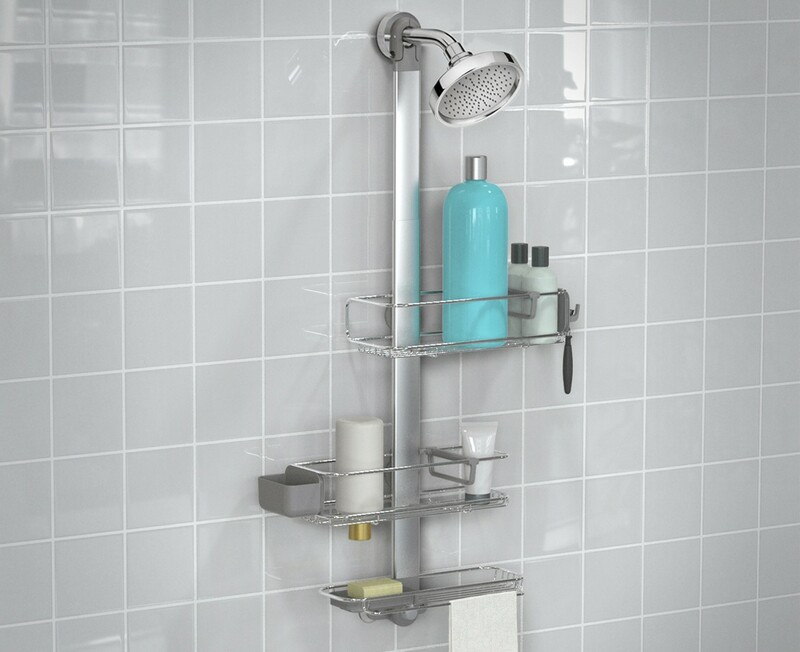 The adjustable plus caddy is very useful for shower cubicles where the shower head is higher up than usual. I have both the adjustable caddy and adjustable plus caddy and both of them fit my showers perfectly. The shower caddy does a very good job of holding all things needed in the shower. It is customisable, so you can move most of the parts to suit your needs, even the grey boxes. Very happy to recommend it to anybody. Goes great with our modern, clean style and provides space to accommodate growing family needs. I ordered Simplehuman because it is by far the best make in shower caddies. Their newest caddy has three shelves with perfect adjustment capabilities. It can hold very large shampoo bottles and many more. It's perfect for young adult who has lots and lots of shower bottles. Fantastic buy! I've had my caddy 1 month now and am thoroughly enjoying it. It was easy to assemble, locks securely in place, and holds a lot of my shower stuff. I feel so organized in the shower now! This shower caddy is amazing. They style is very modern but still gets the job done when it comes to storage space. With three shelves, and a bar to hang your washcloth, it gets the job done. Exactly what I wanted/needed. A slightly longer caddy to hold shower items. Great attachment and excellent adjust-ability. 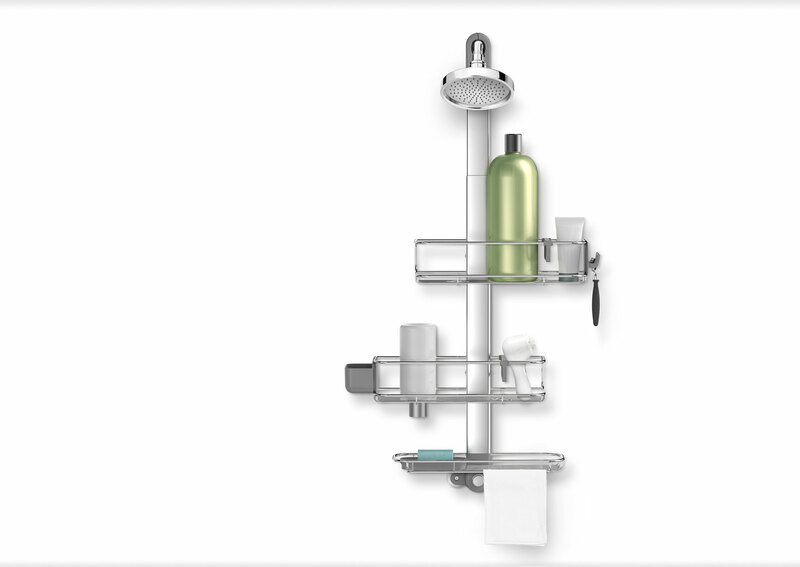 Adjustable Shower Caddy - a Winner! Great product - excellent overall quality, easy installation, appears very durable and well made. Very happy with product. Even my perfectionist husband is pleased with construction and design.Maybe it was just me but figuring out how to peel off plastic on suction cups was confusing. Still not sure if they're right! This was advertised to be adjustable up and down. While it does adjust up and down quite a bit, the shelves can only be adjusted a certain distance up and down - not the entire length of the adjustment because of the way that it adjusts up and down. I was hoping for more height in all the shelves. While I get some of that because of the horizontal movement, it's not what I was hoping to get. This design problem needs to be fixed or the description needs to be changed to make this problem clear to the consumer. Shower caddy is nice but the adjustment wheel on the back is very difficult to loosen and adjust. I really like the ability to lengthen the caddy, the wash cloth holder, and the 2 postioning suction cups. I do wish there was a rubber or plastic coating on the backs of the shelves, as they do rub on the shower tile if the cups let loose and they do come loose. Very Nice and Sturdy, plus a couple suggestions. Purchased (2) of the tallest caddies about 4 weeks ago. So far so good. I am a metallurgical engineer and am generally critical of the mostly POS consumer products on the market these days. These caddies are not one of those. Not sure what grade of stainless steel these units are made from, but if it is 316L grade, then these units should never rust. If it is something lessor, and some rust spots develop, they can be rubbed off using some stainless steel wool (don't use regular steel wool) from a hardware store. These are very sturdy units, very EZ to install and are quite functional. The distance from my shower head pipes and faucet controls is about 4 feet, so I have a lot of room for a taller caddy ... which is one of my suggestions for future product improvement ... offer even a taller version, with one more shelf. We have numerous very large product bottles on the shelves, and would like to have a few more inches of vertical height to fit everything on the shelves. Also, not sure yet how the plastic soap dish and the other small plastic holder will hold up over time. Not a big deal, but I see no need for these parts. Simply make the entire unit from the stainless steel wire frame. Maybe add a couple of hooks near the bottom to hang wash cloths, hand scrub brush, or other wash accessories. Also, would like to have maybe a couple of small o-rings off to the sides to hang tooth brushes or razors. The current razor holder is probably good for most razors, but the razor I have tends to fall out of that device. Maybe (2) small wire o-rings on either side of the top shelf could be added for this purpose ... slightly different diameters ... smaller size for the toothbrushes. Otherwise, these are the best shower caddies I have ever purchased. We finally got rid of those cheap rubber coated steel frame caddies sold everywhere. After 2-3 years, all of those start cracking and losing the dip coating and then rust like crazy. I think I have replaced mine at least 6 times over the past 20 years. Congratulations on the nice product line. Thank you for your review. We've forwarded your feedback to our product development team for consideration. 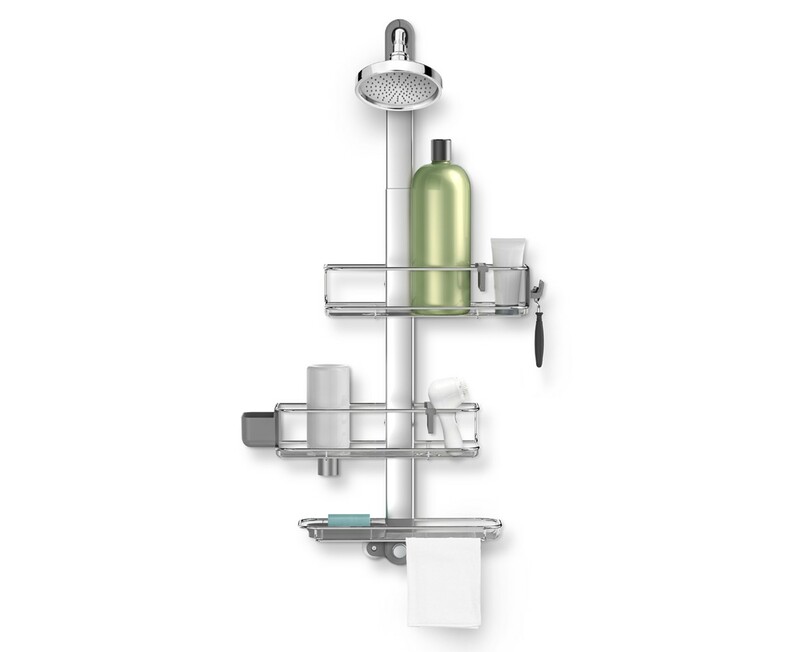 Like most other SimpleHuman products, this one is well-designed and will outlast any other shower organizer. Mounts securely, extremely adjustable, and doesn't rust. SimpleHuman stands behind their products (speaking from experience) so expect this caddy to be around a really long time. This caddy contributes to the aesthetic of my shower, and allows me to store larger containers for easy accessibility while showering, and performing my hair care. Love it. Looks great and is very functional. My girlfriend and I were initially a little concerned about the price, but now we're very satisfied with the quality. Can't really imagine a better shower caddy. EXACTLY what I was Looking for. EXACTLY the right form, function, & value. So far, so good. Very nice and so far it has not rusted like other brands. Easy to mount and looks good. Hopefully it will stay nice and not rust for a long time.